When your workout needs a little more kick, there's Extreme Sport Beans. Each serving contains 50 mg of caffeine, about the same amount in a half a cup of brewed coffee, along with Sport Beans' clinically proven formula of carbohydrates, vitamins and electrolytes. And the delicious Assorted Flavors will keep you refreshed throughout your exercise. For athletes, caffeine provides a range of documented benefits including improved endurance, reduced perceived exertion (RPE), enhanced agility, faster sprint speeds and increased power output. Click here to read a recap of various clinical studies on caffeine and sports performance. 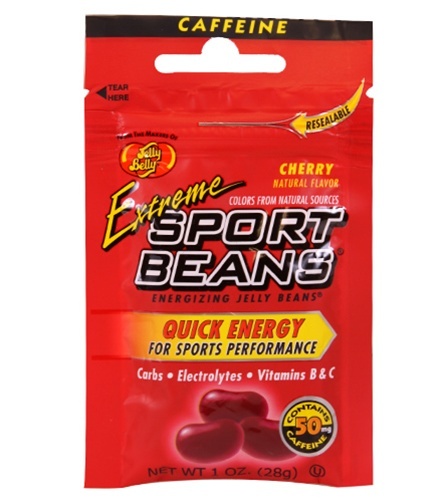 Extreme Sport Beans are not recommended for children, teens, or pregnant or nursing women.